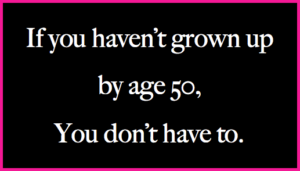 It’s funny I could have cared less when I turned 30, didn’t mind particularly turning 40, but 50? That was a little strange and sort of a wake up call— albeit a good one. The milestone shouldn’t be a time to panic or time to lament all the things you regret—for me, it’s really served as motivation to press ahead, be better and do more. Yes knowing it was coming motivated me a great deal to kickstart aspects of my professional life– things I’ve been putting on the back burner for years. Launching new projects and improving current ones are now bigger priorities. It made me attempt to become more patient in my personal life with my family and loved ones—something I know I needed to improve on. But it also made me more motivated to not stop at a silly number but continue this mindset moving forward. 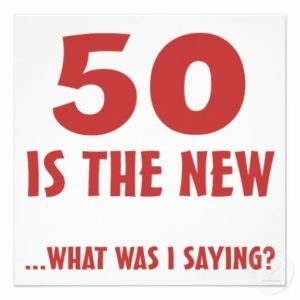 It’s funny when you’re a teenager or even in your mid twenties, the thought of being 50 seems like you should have everything figured out on so may levels—but that’s certainly not the case….. Months before the big day, I wanted to do something special for such a milestone but didn’t have time and that was OK. My summer getaway a few weeks earlier more than sufficed. Life is not over at the half century mark–still plenty of time on the play clock to enjoy life and cross items off the ole bucket list. In my heart I still feel 25 but constantly get reminders that I’m not. A young man saying “sir”, seeing Madonna turn 60 or maybe it’s my 16 year old having a boyfriend ?! Reality checks are everywhere. 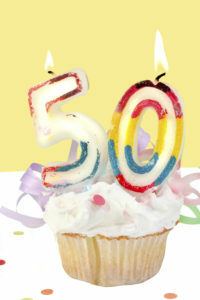 It’s Ok, turning 50 for me and many of my friends is a time not to shake your head at your pending AARP card but to count your blessings—great health, family and friends—the older you get you find, that’s all that really matters. When in doubt, listen to the great Satchel Page, 50 is a number but if I didn’t know any better, I feel a lot younger. Thanking the BIG 5-OH our first pitstop in another drive around the NABORHOOD, as always really appreciate you stopping by. MY LUCKY CHARM: Call it coincidence or just plain beating the odds. 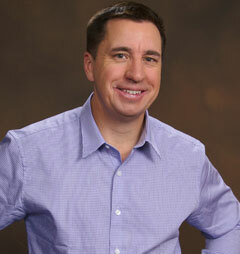 We all have good luck charms—mine happens to be my college fraternity big brother Tim Delikat. 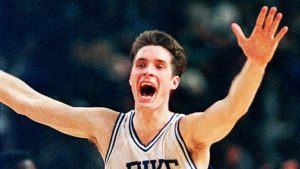 Yeah Laettner crushed Kentucky and I preceded to crush my Big Bro tackling him in his living room and screaming as loud as any Duke fan that day. 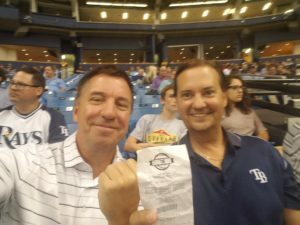 Fast forward 27 years later where my man Deli and I attended one of many Tampa Bay Rays game but what made this different is for the first time we played the stadium’s 50/50 Raffle. Every stadium in the country has this version of the “sporting lottery” where you chip in five, ten or maybe 20 dollars, get a few numbers—if you win—you win 50 % of the pot, the other 50 often goes to charity. For innings, I was calling my shot—telling Deli we would win–deep down just hoping but really never really believing it. Innings later, the stadium made the big announcement and out of all of our numbers–the last one on the list had the winner—and we were winners! The great thing about baseball is you are guaranteed to always see something for the first time—well his was living proof . Once we collected our winnings (about 1800 each ?!) we got back in our seat and promptly saw the Rays Ji-man Choi beat the Indians with a walkoff homer…….more winning!! Never had a better day at a baseball game and in the coming weeks, I’m gonna meet my man Deli at a 7-11 and we’re gonna play the lottery. We had Laettner and then the 50/50 raffle—maybe we have reached our quota….or maybe not? 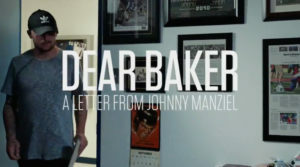 MANZIEL MULLIGAN: Found it very interesting that ESPN recently did a segment having Johnny Manziel pen a letter to current Browns QB Baker Mayfield. Full disclosure—Loved Manziel, loved watching him play in college where he is the most exciting player I’ve ever seen in person but I hate the way the story seems to have ended. Johnny Football wasn’t committed and couldn’t stay out of trouble where it appears he may never get another shot. I also love Baker Mayfield. While his swagger makes many compare him to Manziel along with the fact he was a first round pick of the Browns, Mayfield is a much different personality on and off the field. He’s actually more Drew Brees as he may not have the big arm but he’s as accurate as they come and that’s what it takes to make it in the NFL. A sad commentary given Manizel didn’t take his own words to heart and is now trying to find himself in the CFL while Mayfield just led the Brownies to their first victory since amazingly Christmas Eve of 2016—and he did it in dramatic fashion. 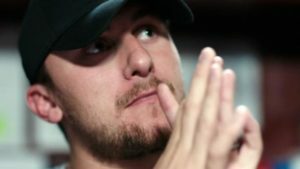 Watching that Thursday night game, I wondered if Manziel was watching feeling any sense of remorse or if he cared at all? The answer came in this piece, where it seems he has lots of regrets where you know he sees Mayfield’s success and thinks that could have been him. 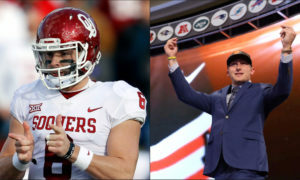 NCAA GOLD STAR—It’s as easy to pick on the NCAA as many have done on Manziel in recent years—they often go left when many of us want them to go right but finally they got something well ….right. Their decision to give players an extra year of eligibility back in June if they play four games or less has been great for the sport, especially if you’re a quarterback. The ultimate hypocrisy of coaches being able to leave at a drop of a hat while the players are confined to stay and play for a coach or a system that they were recruited in –simply isn’t right but this rule helps on many fronts. 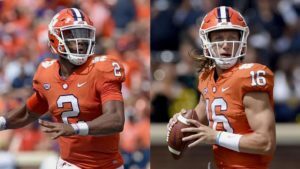 Credit Clemson Coach Dabo Sweeney for telling his quarterback Kelly Bryant who led the Tigers to an ACC Title and a College Football Playoff berth that he would be benched in favor of rising star Trevor Lawrence—the NCAA rule now frees players like Bryant to move on to another school without sitting out a year and losing a year of eligibility. See NCAA—it’s not that hard. Hopefully on the horizon they will eliminate the one and done rule in college hoops and give athletes some compensation. I get it, scholarships are huge but these athletes bring a lot of money into the programs and often come from tough backgrounds—you don’t have to give them a lot of money, but a little spending money would eliminate a lot of trouble most programs run into. Many and for good reason thought this would NEVER happen. I was almost one of them but always left the door open for Tiger Woods to finally when a golf tournament again. 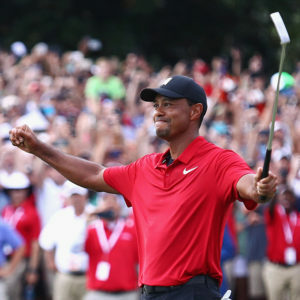 It was hard with Tiger’s multiple back surgeries and the fact he was arrested just a little over a year ago but I was happy to see him pick up his first victory in an amazing five years. I’m not a huge golf fan but Tiger always has made me drop the remote and I’m hardly alone. His flair for the dramatic and the excitement he brings is without peer. So many times in life we want to bury people if they make a mistake, it’s ok to give people a second chance—good to see El Tigre make the most of his. EXTRA POINT: Ok—I had the Falcons and Texans as my Super Bowl teams—can I have a second chance? With a quarter of the season in the books—give me the Rams and how bout the Bengals!